We uneveil to introduce Quantix and AV DSS for agricultural market, the latest tools for the professional grower designed and developed in America with farmers for farmers, delivering on-demand field intelligence enabling confident decision making, saving time, and money. Today, a global leader in unmanned aircraft systems (UAS), Quantix hybrid drone, is now available for sale. 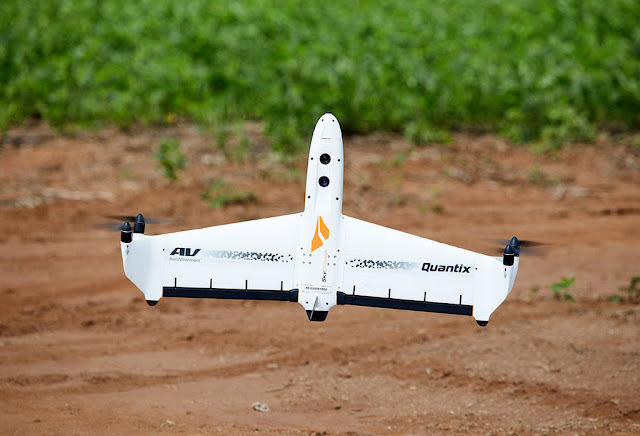 In terms of pricing, a complete Quantix hybrid drone and AV DSS bundle sells for $16,500. After the first year, one-year subscription to AV DSS, which includes access to your historical data and access to the advanced analytics platform, is about $3,000 per year. Quantix DSS system really brings intelligence to the farm. A resource to manage issues such as water and nitrogen and disease detection. A powerful tool to maximize your time and effort in your fields. You can pull this out of your truck set it on the ground in covering the amount of area that you need covered for that specific flight and with one touch you're up and flying. It has a VTOL which is the vertical takeoff and landing as well as the fixed-wing which is designed for coverage. It's a hybrid drone first in its class in less than an hour, you are now looking at your entire field. That plant is giving you all kinds of signals and it's telling us before we can recognize the problem. So, you find things before it's a huge issue. We'll be fine two sensors for every flight they're fully integrated within the drone. We have a RGB camera and a multispectral camera, controller tablet with flight software and Quick-Look maps to conduct in-field assessments. Quantix drone captures all those variations. In all these different light spectrums to give you different information based on what you're really looking for. The farmer needs to ground truth those examinations of canopy cover and anomalies layer and figure out exactly what they are. Canopy coverage indicates plant health. The anomaly layer indicates plants that are performing better or worse than others. Once your data has been uploaded to decision support system (DSS), you'll have the ability to log in to the cloud and evaluate those flights. It's a user interface that allows the farmers to manipulate their data to set parameters within their operation and within DSS. And then, the grower can go back and research year-to-year really what their crops have done and really change some of your farming practices. As you move through the years, you're looking for what it does over a period of time. And then, you can actually glean out the proper information to be able to give you the total picture be able to use inputs and water more successful. The drone technology has been out there for a long time, but people haven't really had the chance to grab on to it and use it every day. So, you can maximize the number of yields per acre all the way around the world to help feed the world in the future. It's going to make more efficient and just be able to make better management decisions plain and simple quantities. And the a decision support system providing more actionable intelligence for smarter farm. 0 Response to "Quantix Drone Price"